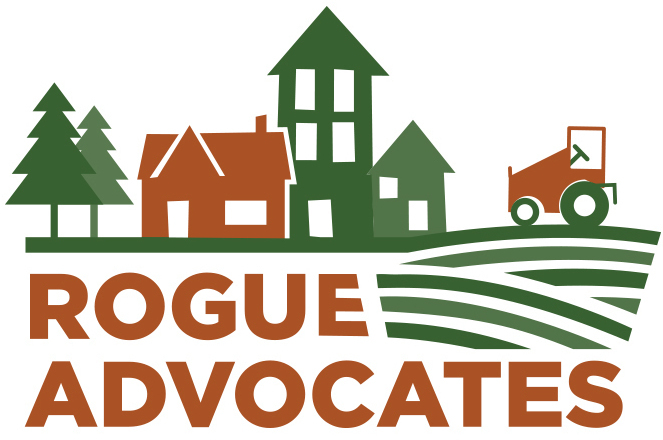 Rogue Advocates maintains a comprehensive land use tracking program in Jackson and Josephine counties. We monitor land use proposals at the city and county level in our area of concern, and when any proposal raises concerns pertinent to our organization's public interest mission, we take the appropriate level of action to address these concerns. Land use proposal notices, which are published on a weekly basis, are available at the Department of Land Conservation and Development (DLCD) website. Oregon has a strong land use system with a range of sustainability goals and laws that protect our valuable resources and all that we love about our state. The statewide land use system also requires that cities and counties comply with these laws. Rogue Advocates also monitors local land use proposals for compliance with these state laws that protect resource lands (i.e. farmland and forest lands), open space, clean air and water and call for affordable housing, a range of transportation options and citizen involvement. Land use projects that we have been or are currently focusing can be found on the Issues section of our website.